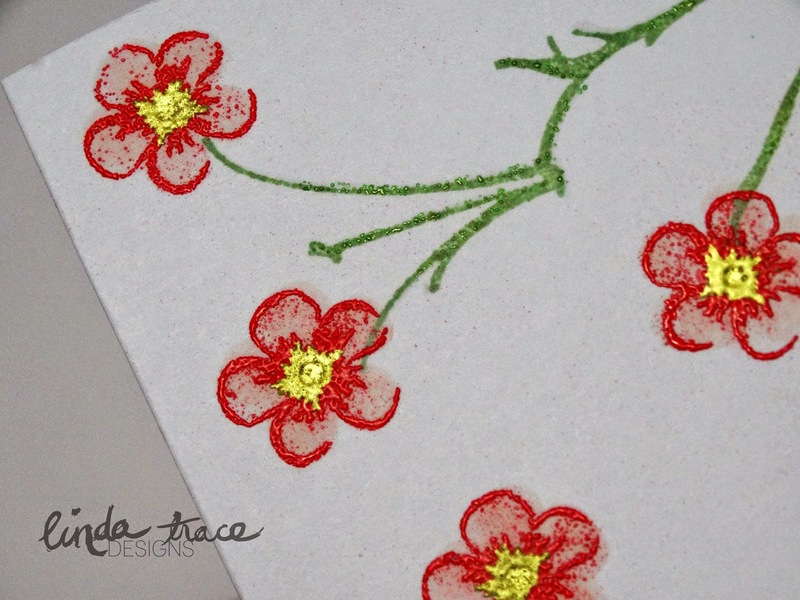 LINDA TRACE DESIGNS: Embossing Time at A Blog Named Hero! Embossing Time at A Blog Named Hero! Sorry this post is a little late! I used the Vintage Flowers set from Altenew for this card. Next I stamped my Cherry Blossom flowers, around the branch and panel, in Simon Says Stamp Cotton Candy Ink. This pink is SO soft and subtle, it's just lovely. After that ink was dry, I went over my panel with an embossing powder tool, and stamped the outline of the flower in Versamark Ink, before heat embossing that layer, with Zing Rouge Embossing Powder, to give a nice vibrant red. I'm totally OK with the little flecks of red throughout the petal, it gives the flower a more natural look. The pink and red wouldn't be perfectly defined on a real flower, so this worked out well. Lastly, I added the centre of the flowers, with Versamark again, and heat embossed using Ranger Gold Superfine Detail Embossing Powder. Lastly I stamped my sentiment from the Hero Arts Hello Flowers stamp set, in Black Hero Arts Dye Ink. I then went carefully around the right-hand edge of each letter and added highlighting with my Versamark pen, and then added Ranger Superfine Gold Embossing Powder, to give a gold drop-shadow effect. I really love it. To finish it off, I scattered some My Minds Eye Gold Dots, and mounted the panel on black cardstock, and then the entire thing onto some Pink Layering Paper from Hero Arts. I hope you like it! I'm really happy with how it turned out. Please pop over to A Blog Named Hero to see the rest of the Design Team's work, and to enter the challenge! You could win a voucher thanks to our amazing sponsors Simon Says Stamp! Challenge Time at ABNH: One Layer! © LINDA TRACE DESIGNS: Embossing Time at A Blog Named Hero!